Are you tired of your bathroom? Does it need new tiling or is the paint peeling off the walls? Perhaps the colour scheme is outdated, or your vanity needs an upgrade. 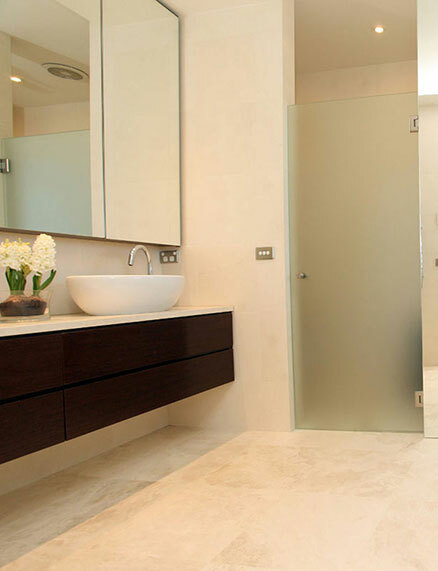 Whatever the bathroom renovations required, Sharpest Constructions is on hand to help. Specialising in a range of renovations and home extensions, including bathroom renovations, we know exactly how to upgrade your bathroom space. Having already completed many new bathrooms in Canberra, we can help you work on how to make your bathroom space so beautiful you won’t want to get out of the tub! There are so many options for a bathroom renovation that the choices can sometimes be overwhelming. Although there is a huge amount of possibility in exactly how your bathroom can be renovated, we take the time to go through the options with you to ensure you choose a design that suits your home. As a renovation company, we believe in helping you every step of the way, beginning with assisting you in matching the ideas you have into a practical design that suits your budget. A bathroom upgrade not only improves your home but it can also increase the value of your house, which is why a bathroom renovation is a good idea even if you plan to move in the coming few years. No matter the reason for your bathroom renovation, we will be around to assist you throughout the entire process, from design to the completion of the construction. At Sharpest Constructions, we pride ourselves on our safety record. We ensure our builders are working to the highest safety standards to keep your home and family safe throughout the entire renovation process. If you have an older house, there may be asbestos in your wet areas. This is potentially hazardous, but we can arrange the safe removal of the asbestos products to help protect you and your family. No matter what the renovation idea you have in mind – no matter how big or small – we are happy to help. With years of experience in updating our customers’ bathrooms throughout the ACT and NSW, we have the knowledge to make your bathroom the perfect space. If the current design and look of your bathroom is getting you down, don’t despair. Call us today for a free quote and see your bathroom get upgraded into something you love in no time at all.